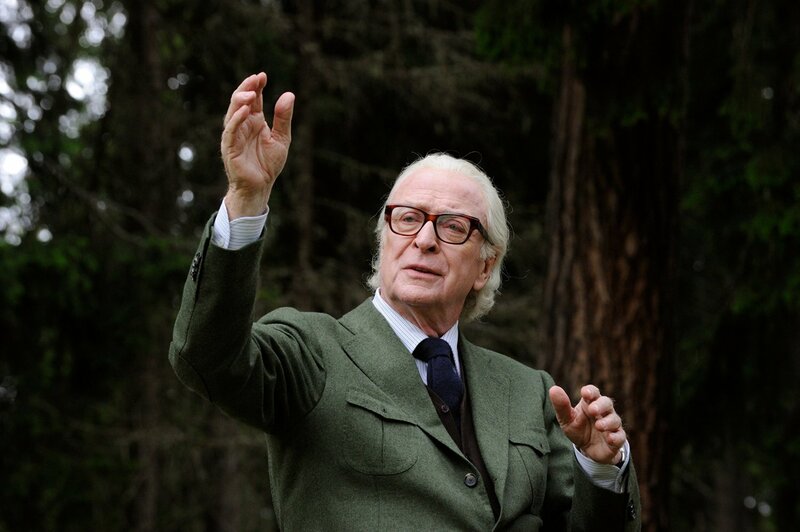 Paolo Sorrentino’s new film “YOUTH” interweaves many themes, all framed perfectly by Luca Bigazzi’s lush, sometimes surreal cinematography: Aging & Youth; Ambition & Apathy; Fleeting Memories; Lost Loves. 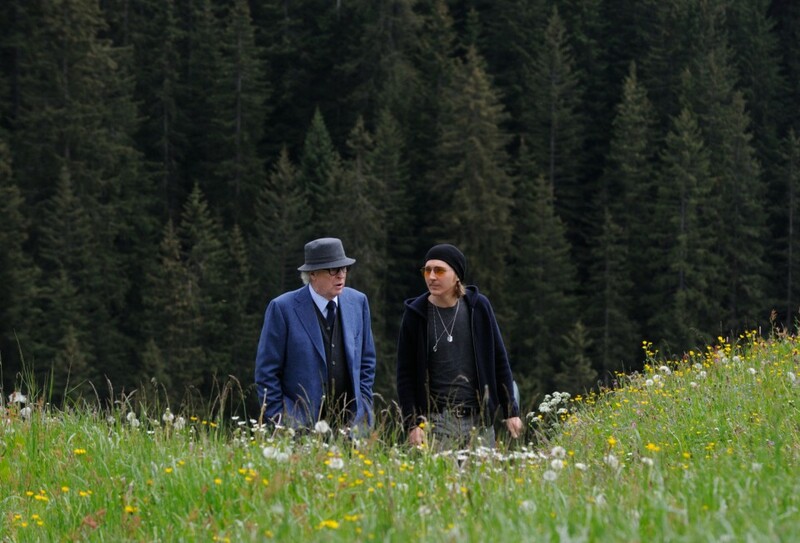 The film revolves around two old friends Fred Ballinger (Michael Caine) and Mick Boyle (Harvey Keitel) in their late 70s who have come on vacation to an Alpine spa resort in Switzerland. Mick Boyle, an over-the-hill movie director, is on a working vacation determined to finish writing a film that will be his last testament. Fred Ballinger, on the other hand, wants a complete withdrawal from the life he once led as a renowned orchestra conductor and composer. “Tell them to forget me,” he says to an emissary from Queen Elizabeth who has come with an offer of knighthood if Fred would agree to conduct one last performance of his most popular composition, an operatic medley titled “Simple Songs”, for Prince Philip. There is a certain romantic, playful melancholy in the film’s vast, idyllic and secluded Swiss spa location. Sorrentino used those locations to allow the key characters the freedom to disappear, wander, or pace about as if the entire vast spa location was a lavishly-realized set, and for the audience an elaborate menagerie to observe. The music clearly is a recurring character in the film, from Fred’s original compositions to the songs by the eclectic entertainers who appear at the hotel. Pulitzer Prize-winning composer David Lang created Fred’s music and the film’s score. His work resulted in a soundtrack involving varied artists. 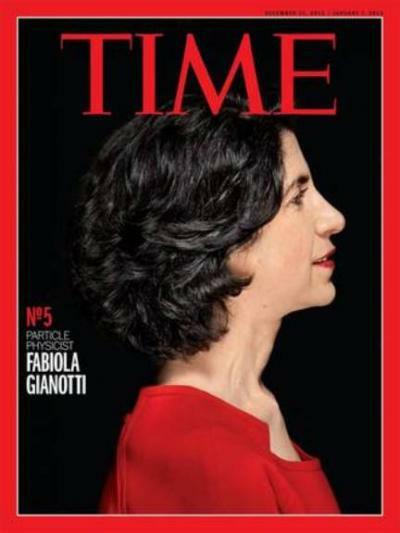 Paolo Sorrentino also included tunes such as a cover of Florence + the Machine’s “You’ve Got the Love,” is ever apt, and they seem to work very well too. YOUTH climaxes with a scene of a beautiful, heart-breaking orchestral performance of “Simple Songs” by Grammy-winning Korean soprano Sumi Jo. The piece’s orchestration (even with unremarkable lyrics ”I’ve got a feeling. I live near. I live for you now.“) brings out a wealth of emotions that soprano singer Sumi Jo conveys through a heart-breaking performance. There is a mesmerizing scene in the film where Fred Ballinger is standing all alone in the countryside surrounded by cows. He hears cowbells and the sound of birds taking flight, and starts to conducts an imaginary orchestra with a whimsical piece “The Wood Symphony,” synchronized with the motion of cows and with the only audible sounds coming from their cowbells. This was an original David Lang composition. Fragments of “Simple Songs” are played by different figures: a young boy practicing his violin, and the virtuoso violinist Viktoria Mullova and the soprano Sumi Jo, who perform the work with the BBC Concert Orchestra on screen and on the soundtrack. “Youth” features another piece by Mr. Lang, “Just (After Song of Songs),” a haunting refrain performed by the Trio Mediaeval, a Norwegian choral group. The soundtrack also includes pop, like songs by Paloma Faith, who appears in the film as herself. 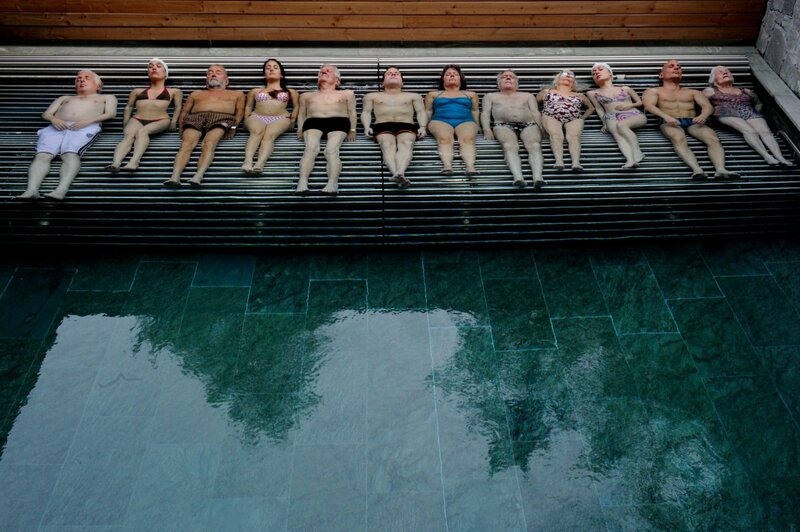 Paolo Sorrentino directed YOUTH in much of the same familiar style seen in his recent creation THE GREAT BEAUTY – a constant flow of images and ideas, organized loosely around a central theme. The Oscar winner (for The Great Beauty) fills every frame with images that constantly evoke his idol, the great master Federico Fellini. There are common themes that unite the film’s Fellini-esque episodes, like the elderly couple who never talk at dinner, or the Miss Universe pageant winner who turns out to be smarter than she looks. The film creates its charm by simply acknowledging that saying something profound is just another stage in the never-ending process of finding meaning in everyday life. Fellini’s influence is very clearly visible in a scene about reminiscences where Mick imagines all his female characters spread out over an idyllic Swiss pasture, reminding him of the past. YOUTH succeeds in delivering its impact because of a certain chemistry between director Paolo Sorrentino and Photographer Luca Bigazzi which certainly delivered the results from a fruitful collaboration between the two. 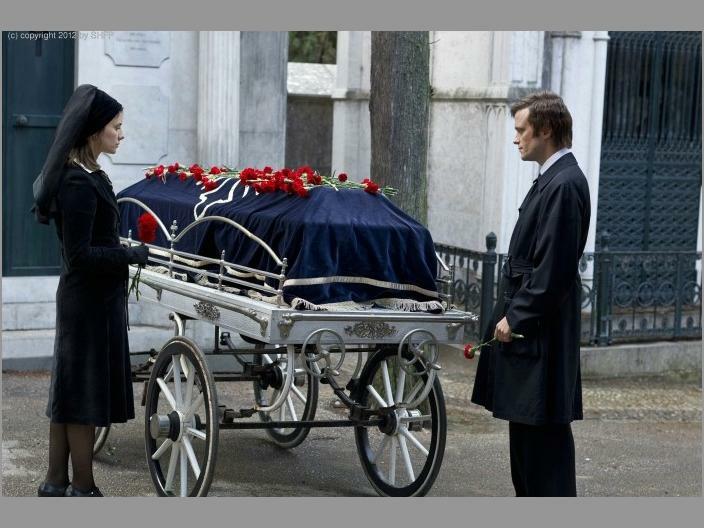 Bigazzi’s evocative photographic composition in each scene brings to mind many references to paintings by Old and Modern Masters references. 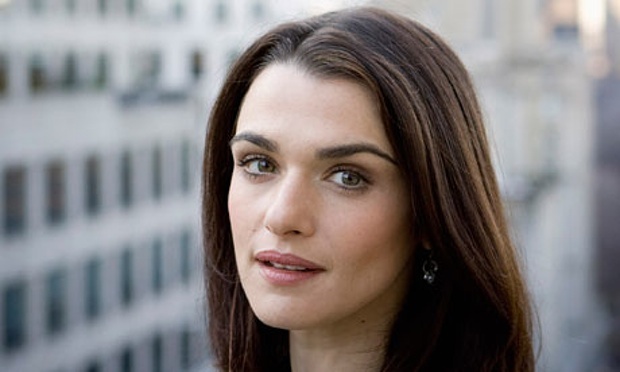 The supporting cast includes Rachel Weisz, Paul Dano and Jane Fonda. The spa is also populated with a fair share of quirky characters, from an obese man sporting a Jesus pendant and a giant Karl Marx tattoo on his back to a masseuse (Luna Mijovic), dancing with her Wii to a hilariously unexpected Adolf Hitler. When a chance encounter with an enigmatic woman leads him to a book that inspires him to question his life, Raimund Gregorius discovers that life can change in an instant. “Night Train to Lisbon”, directed by Bille August (“Pelle the Conqueror”), The film is adapted from the ruminative 2004 novel by Pascal Mercier (the pseudonym for Peter Bieri, a Swiss professor of analytic philosophy), an international bestseller published in more than 30 languages. 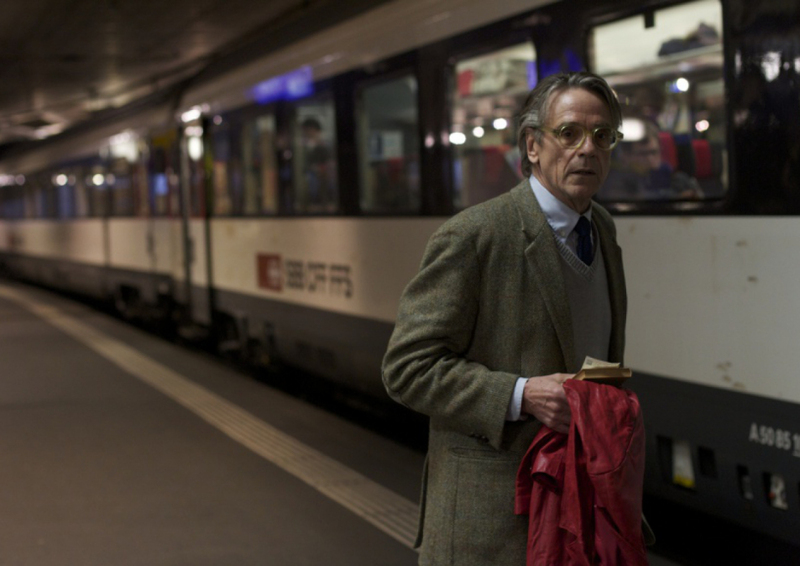 Jerely Irons plays the mild-mannered, aging Classics professor Raimund Gregorius. 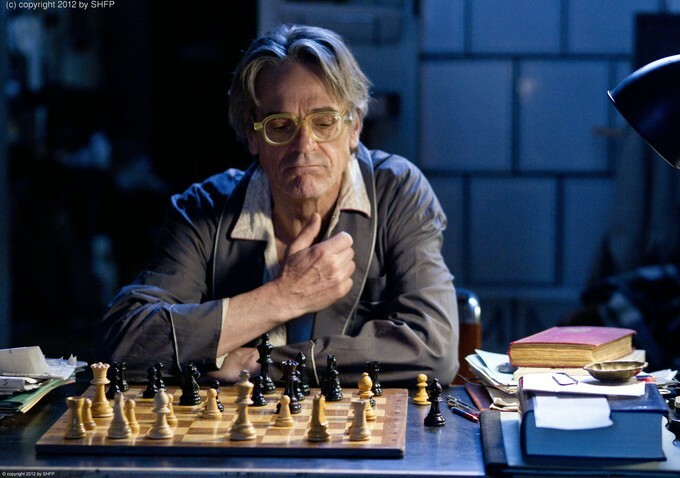 We first encounter him in his solitary bachelor existence at home, surrounded by papers and books, playing a game of chess in which he curiously attempts to outwit himself for some added excitement, boiling the kettle and making breakfast only to find he is out of tea. He is an intellectual but none the less an everyman as he resourcefully takes a used teabag from the bin and uses it again. These opening moments poignantly evoke Gregorius’s state of mind, that he is distracted, going through the motions of a routine and predictable daily life, living in a lonely monotone limbo. This dramatically changes one stormy morning as he walks to the university and encounters a mysterious Portuguese woman in a red coat poised to jump off a bridge. He reaches out to stop her and somehow, almost miraculously, saves her life. He brings her to his classroom, but she soon disappears leaving her coat behind. In a pocket is a book A Goldsmith of Words, the journal of an enigmatic Portuguese aristocrat and doctor, Amadeu de Prado, a Portugese doctor during the period of António Salazar right wing dictatorship in Portugal. The compelling book instantly consumes and enchants Gregorius affecting him deeply with its beautiful philosophic meditations and poetic prose that speaks to his soul and poses the very questions about everything in life that has preoccupied him for years. When a ticket for the titular night train falls from the book’s pages, Gregorius finds himself doing the first spontaneous thing he’s done in a very long time, impulsively abandoning his comfortable post as a teacher of classical studies in Bern, Switzerland,and climbing aboard the train to travel to Lisbon. Gregorius acts as a detective in a restless and enthralling search for the life of a perfect stranger that is ultimately a search for true meaning in his own life. The close film shots of Lisbon’s steep cobbled streets, its intimate alleyways and courtyards shows off this organically alive and beautiful city and heightens the sense that Gregorius must uncover the secrets of its past. Behind the grand and crumbling facades of the buildings he is changed by his meetings with de Prado’s surviving relatives and friends and unravels the mystery. The clues to solving the mystery of the philosophy book lead to painful memories of the author’s life in the underground resistance movement during the fascist regime of Salazar, related by a deadly all-star cast of international faces. As he puts the puzzle together, flashback scenes also vividly bring the time and place and the political and emotional intrigue of the 1970s back to life. He learns that de Prado was an extraordinary man, a person of blazing integrity, a difficult, brilliant, charismatic figure, a doctor and a poet, and a rebel against Salazar’s dictatorship. He also discovers that de Prado died very young from an aneurysm in his head. As de Prado’s story comes to light so, too, Gregorius himself begins his life anew. Once in Portugal, he looks up the author; visits his severe sister, Adriana (Charlotte Rampling); and learns that Amadeu died in 1974 and that only 100 copies of his book were printed. The movie proceeds as a historical detective story that intersperses Raimund’s investigation with lengthy flashbacks to a past in which we meet the young Amadeu (Jack Huston), a charismatic member of the resistance to the dictatorship of António Salazar. The characters in Night Train to Lisbon are enthralling. Even those Gregorius meets only once are significant and every role, no matter how small, has substance. The performances are beautifully observed and masterfully nuanced: Jack Huston, son of the famed actor and director John Huston, gives a compelling portrayal of the passionate Amadeu, of his sensitivity and surreal other-worldliness. As the young Jorge, August Diehl encapsulates the depth of his inner turmoil and confusion; Mélanie Laurent illuminates the screen as the young Estefania, the embodiment of her youth and idealism; Charlotte Rampling evokes pathos and foreboding as Amadeu’s disconcerting sister Adriana who is frozen in time; Martina Gedeck charms as the sympathetic, supportive and openhearted optician Mariana who helps Gregorius to see more clearly both literally and figuratively. Poignantly looking back over their lives the older actors – Tom Courtenay as the older Jaoa, an infirm fellow resistance fighter who was tortured by the police, and Bruno Ganz as the older Jorge who insists he does not trust anyone who does not take a drink and Lena Olin as the older Estefania – are particularly moving as the jealousies and misunderstandings of the past finally come to reconciliation in the present. WITH: Jeremy Irons (Raimund Gregorius), Mélanie Laurent (Estefania), Jack Huston (Amadeu de Prado), Martina Gedeck (Mariana), Tom Courtenay (Joao Eca), Marco D’Almeida (the young Joao Eca), August Diehl (Jorge O’Kelly), Bruno Ganz (the aged Jorge O’Kelly), Lena Olin (the aged Estefania), Christopher Lee (Father Bartolomeu) and Charlotte Rampling (the aged Adriana). Director Mark Levinson’s documentary focuses on the most elaborate and costly science experiment ever conducted. The subject of the film is the Large Hadron Collider, or LHC, a massive, miles-long particle accelerator designed to detect the Higgs boson by replicating, in miniature, the Big Bang. It works by smashing together two high-energy proton beams aimed directly at each other. Comprised of liquid-helium-cooled magnets and complex microelectronics that one scientist compares to a “five-story Swiss watch,” the LHC is the world’s largest crash-test laboratory. 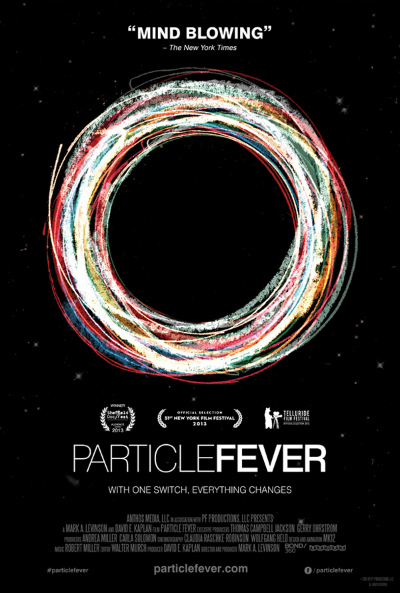 The film follows six physicists from the scheduled startup of the CERN Large Hadron Collider to the discovery of the elusive Higgs boson (or “God particle”), the infinitesimal, hitherto-hypothetical cornerstone of the whole field of particle physics, and a key ingredient in the creation of the universe. Director Mark Levinson earned a doctoral degree in particle physics from Berkeley before veering into film, and producer David Kaplan, a professor of theoretical particle physics at Johns Hopkins, has also been active on History Channel and National Geographic science programs. They’re able to simplify and synthesize without dumbing down the material and put non-science-oriented viewers at ease by drawing a smart parallel between science and art. The Nobel Prizes for Physics just announced for two of the central figures in Particle Fever – Peter Higgs was half the duo of theoretical physicists who first predicted in 1964, the existence of the so-called God particle that was the ultimate glue to the universe: The Higgs-Boson particle. The Nobel Prize in physics ultimately went to Peter W. Higgs and Francois Englert. The film succeeds in making the normally intimidating and arcane world of genius-level physics at least conceptually comprehensible and even friendly to the lay viewer. This unexpected look at the long run-up to and successful completion of the most elaborate and costly science experiment ever conducted — the use of the Large Hadron Collider to attempt to find the Higgs boson — is not only fascinating, but also humanizes the field in a way that will inspire practitioners and provoke the curiosity of non-specialists. 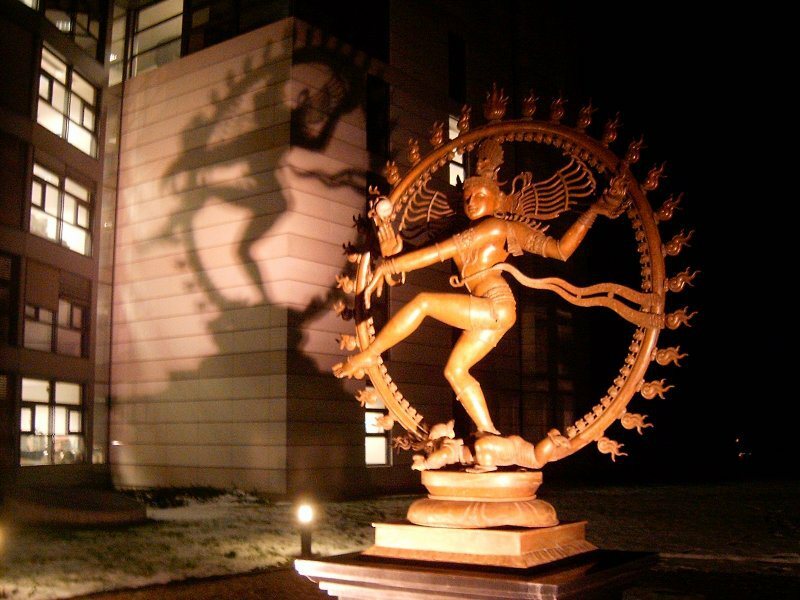 “THE CREATOR & THE DESTROYER” : Statue Depicting A Dancing Shiva (Nataraj) In Front Of The CERN Large Hadron Collider. It also doesn’t hurt that both the metaphysical and the (literally) physical backdrop for the film is enormous. 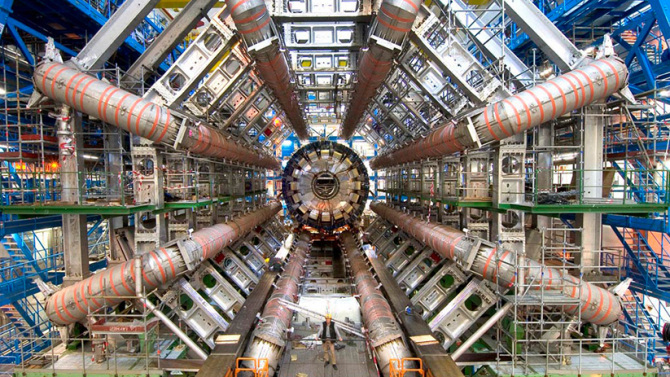 The Large Hadron Collider (LHC) is the biggest machine ever built. Buried underground in Switzerland, it resembles but dwarfs any set ever built for a James Bond film, measuring seven stories tall and consisting of a 17-mile ring through which protons, powered by seven-ton super-conducting magnetos, will be sent to collide with each other at a speed aimed to reproduce conditions such as those just after the Big Bang. The Atlas Experiment, which was initiated in the 1980s, involves 10,000 people from 100 countries and the use of 100,000 computers to deal with all the data. An even bigger such machine was started in the United States but was canceled by Congress after a few years because there were no specific military or commercial applications for the experiment. ( so much for shortsightedness). In addition to its impressive size and scope (it’s the largest machine ever built by man), the LHC unites 10,000 scientists from 100 countries in excited, collaborative harmony. What is its reason for existence? This is described in many ways: To try to understand the basic laws of nature, to discover the key particle that holds everything together (which is what the Higgs boson describes), to identify particles scientists know are out there but haven’t been seen and, in the simplest terms, to learn which group of theorists is correct — those who believe in the “super-symmetry” of one universe or the adherents of an ever-expanding “multi-verse” based on randomness and chaos. Apparently the weight of the mysterious particle will determine which of two contrasting theories will hold sway: “supersymmetry,” which posits a harmonious, stable, knowable world, or “multiverse,” which proposes a more chaotic, unstable one — and might well annihilate well-established concepts underlying scientists’ lifelong endeavors. 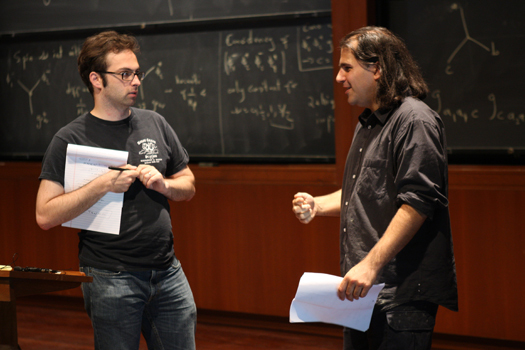 Kaplan and long-haired lookalike physicist Nima Arkani-Hamed cheerfully debate supersymmetry vs. multiverse during the course of a friendly game of table tennis. Nothing can put a damper on the enthusiasm of the savants. When LHC finally achieves collision, the film offers a closeup of young postdoc Monica Dunford exclaiming “We have data!” as billions of bits of raw knowledge streaming into linked-up computers around the world. Shut out of the breathlessly anticipated announcement of the discovery of the Higgs boson because he arrived late, Savas Dimopoulos, a major figure in the experiment and the movie, philosophically sits down, opens his computer and watches, enthralled. But if cooperation and coordination are the joyous order of the day, all is not smooth sailing. The media hoopla that greets the first one-way circling of the collider proves premature as the project is plagued by delays and malfunctions, providing the filmmakers with a wide range of emotional ups and downs, as well as plenty of “Houston we have a problem”-style suspense. The huge cost of LHC and the nonstop media buildup place additional pressure on the scientists to produce results, particularly since the collider offers no immediate military or commercial payoff. Particle Fever imparts a great deal of information while bringing to light a rarefied world defined by intense mutual interests and great camaraderie coupled with inevitable competitiveness. The big split among physicists is between the theorists and the experimentalists. 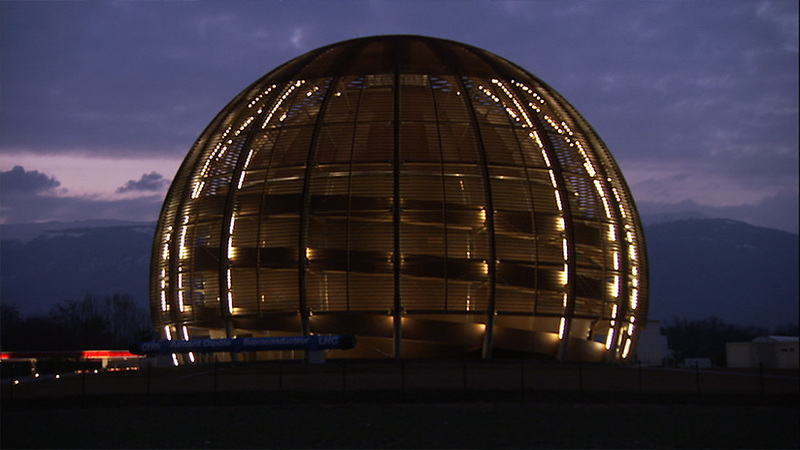 On July 4, 2012, the results are finally obtained, to the joy of those assembled at CERN and in other smaller gatherings around the world. Among the crowd packed into the auditorium is aged British physicist Peter Higgs, for whom the elusive particle was named and who is seen removing his glasses and dabbing his eyes. It’s a well-earned moving climax to the film, as it’s evident that a major frontier has been conquered and new horizons opened up. A clip from Werner Herzog’s cave art documentary Cave of Forgotten Dreams is used to again invoke the link between art and science in the search for coherence and meaning. 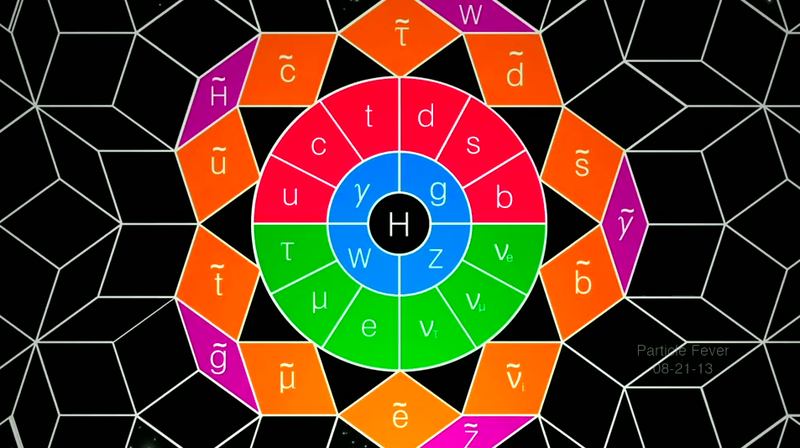 And the story will continue as the Collider gets retooled and made stronger for the next phase in two years, pitting the “super-symmetry” of order against the randomness of “multi-verse.” So far the Higgs has not provided a definitive answer, which makes for great storytelling, if not definitive science. 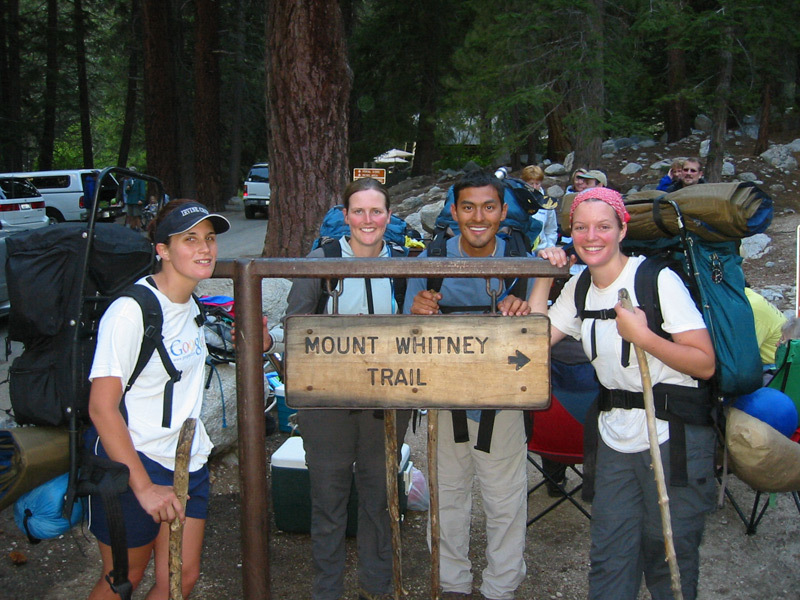 Monica Dunford: Awarded a prestigious Enrico Fermi Fellowship from the University of Chicago, Monica’s gung ho, adventurous spirit has led her not only to the frontiers of science, but to the boundaries of human endurance. Her “leisure” activities of marathoning, cycling, rowing and mountain climbing have provided useful conditioning for the 16-hour days she regularly spends working on the ATLAS detector. As a young American post-doc, she is excited to be at the center of the physics universe and anxious to make her mark during her stint in Geneva. Nima Arkani-Hamed : An intense, outspoken young theorist, Nima’s father was also a physicist, who spoke openly against the Iranian Revolutionary Guard after the revolution in 1979. In fear for their lives, the family fled into Turkey on horseback. Nima now treats physics with the same life and death imperative. Snatched up by Harvard with a full professorship before he was 30, Nima moved in 2008 to the Institute for Advanced Study in Princeton. With many of his ideas poised to be tested at the LHC, Nima hopes to make the impact his colleagues think he is capable of. 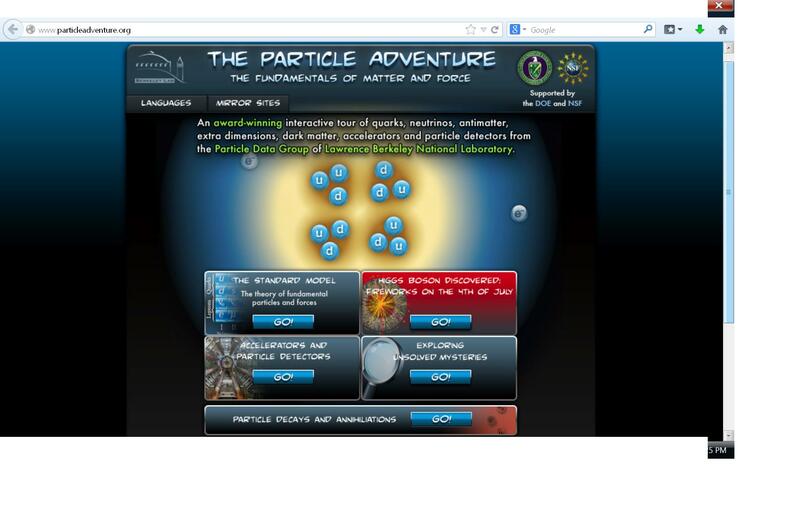 He bet several years salary that the elusive Higgs boson would finally reveal itself at the LHC. Mike Lamont : Trained as a physicist in England, Mike migrated to the engineering side of the actual collider machine in Geneva. As Beam Operation Leader, he feels a personal responsibility to “deliver beams” of protons to the experiments. 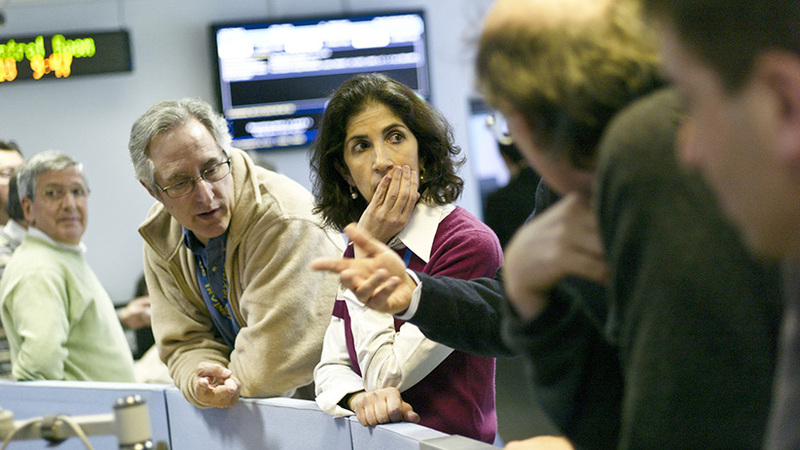 His dry wit has been a welcome relief in the adrenalin-charged, high-pressure environment of the CERN Control Center. 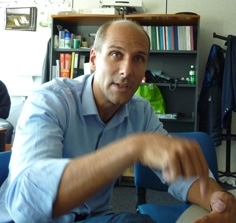 Martin Aleksa : Arriving from Austria over 12 years ago, Martin now has a coveted permanent position at CERN. He was one of the original designers of one of the central components of the ATLAS detector, the Liquid Argon Calorimeter. 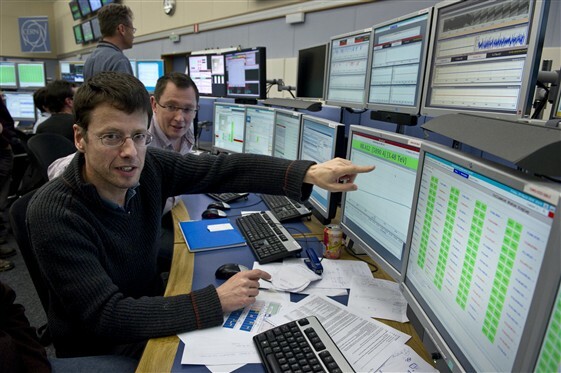 Elected to the position of ATLAS Run Control Coordinator in 2011, Martin was handed overall responsibility for the collection of data from the ATLAS detector just as the LHC began to produce its first new results. 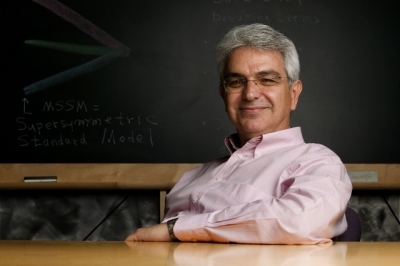 Savas Dimopoulus: A Greek immigrant who now occupies an endowed chair at Stanford University, Savas has been on an odyssey for 30 years to find the true theory of nature. Many consider him the most likely to have a theory confirmed by the LHC, potentially winning the Nobel Prize. A mentor to many in the field, Savas has recently begun to feel the pangs of age, and worries if he’ll be an active participant in the next revolution. SISTER is an often touching, sometimes funny story about a pair of castaways and the moral awakening that brings them together and shows the director Ms. Ursula Meier under the influence of the Belgian filmmaking brothers Jean-Pierre and Luc Dardenne. (Even “Sister,” the English-language title of the movie, which was originally called “L’Enfant d’en Haut” or “The Child From Above,” evokes Dardenne films like “L’Enfant” and “The Son.”). The Ursula Meier’s French-Swiss co-production Sister, is Switzerland’s official submission for Oscar Best Foreign-Language film consideration. Simon (Kacey Mottet Klein) lives with his older sister (Léa Seydoux) in a housing complex below a luxury Swiss ski resort, where he ekes out a living picking off relaxing resort-goers from coat pocket to backpack, emptying them of money, gear and food. Every day, he sneaks up on to the slopes and in between these minor raids walks off with expensive skis that have been nonchalantly set aside by their owners who live up in this high, rarefied atmosphere of wealth. No one notices him because he looks so innocuous, as tiny and near-invisible as one of the birds pecking at table crumbs, and because he constantly changes his wardrobe with newly pilfered items. Then he sells it to buy food for himself and the jobless Louise (Léa Seydoux), who tells various boyfriends that this kid brother of hers is only staying temporarily. Simon and Louise are bound together by ties of shame, guilt and fear, and Simon’s thieving is a pathetic attempt to buy love; he is a breadwinner of sorts but his stealing is also a kind of compulsion that he cannot understand, still less control. Simon has his stealing down to a science (until unforeseen circumstances). He knows where and when to find the goods to steal and has a system that lets him transport the booty down to the valley, where he sells his haul to mostly young, returning customers. With his sister drifting in and out of jobs and relationships, twelve-year-old Simon takes on the responsibility of providing for the two of them. He is able to keep their little family afloat with his small-time hustles and his sister is thankful for the money he brings in. But, when Simon partners with a crooked British seasonal worker, he begins to lose his boundaries, affecting his relationship with his sister and plummeting him into dangerous territory. Louise tolerates the petty crimes, as she’s otherwise focused and soon takes off with Bruno (Yann Tregouet), another loser who has nothing more to offer than a snazzy BMW. It’s Christmas, but Louise has no problem leaving Simon on his own, even as it’s soon revealed that she is actually his mother. Her assurance to him is that he’s still with her even though everyone else wanted her to give him up. Bruno dumps Louise, the mother and child bond, Simon runs into trouble with resort kitchen helper Mike (Martin Compston) and the chef himself (Jean-François Stevenin), but for vacationers all ends well, if not for the folks below. By then, the snow has melted, and Simon’s season on high is over. Sister offers several reasons why the boy can’t or won’t return to ski-resort robbery next winter. But the movie also quietly suggests that, whatever he does, Simon will always be the boy from down below, boldly impersonating someone born to the heights. The second feature by director and co-writer Ursula Meier, who grew up in a nearby region of France, Sister is more naturalistic than her feature film debut, Home. But it explores similar themes, including eccentric family dynamics and life on the margins of European society. Simon and Louise embody poverty and unhappiness in the midst of affluence and contentment. Although Louise eventually becomes more central to the story, the focus remains on the character played by Klein (who also had a role in Home). In fact, Louise isn’t mentioned in the film’s original title, L’Enfant d’en haut — “the child from on high.” Winner of a Silver Bear at the 2012 Berlin Film Festival, Sister is most memorable for its performances, especially Lea Seydoux’s who is in an amazing stretch from her previous role as the subdued reader of Farewell, My Queen. The movie was expertly photographed with handheld camera by Agnes Godard, who shot Home and many of Claire Denis’ films. The crisp editing is by Nelly Quettier, another frequent Denis collaborator. The minimalist synth-and-guitar score was composed and played by John Parish; the voice of his frequent musical partner, P.J. Harvey, enters for the end-credits song. Directed by Ursula Meier; written by Antoine Jaccoud and Ms. Meier; director of photography, Agnès Godard; edited by Nelly Quettier; music by John Parish; set design by Ivan Niclass; costumes by Anna van Brée; produced by Denis Freyd and Ruth Waldburger; released by Adopt Films. In French, with English subtitles. Running time: 1 hour 37 minutes. This film is not rated. WITH: Léa Seydoux (Louise), Kacey Mottet Klein (Simon), Martin Compston (Mike), Gillian Anderson (the English Lady), Jean-François Stévenin (the Chef), Yann Trégouët (Bruno), Gabin Lefebvre (Marcus), Dilon Ademi (Dilon) and Magne-Havard Brekke (the Violent Skier).